SUMMARY: CT angiography (CTA) shows high sensitivity in detecting calcified plaques, but sometimes a bias in the exact quantification of stenosis degree occurs, mainly caused by the high linear attenuation coefficient of the calcified plaques. The purpose of this technical study was to evaluate the most appropriate CT window parameters for the assessment of calcified plaques stating which of them can provide the best inter-observer agreement. 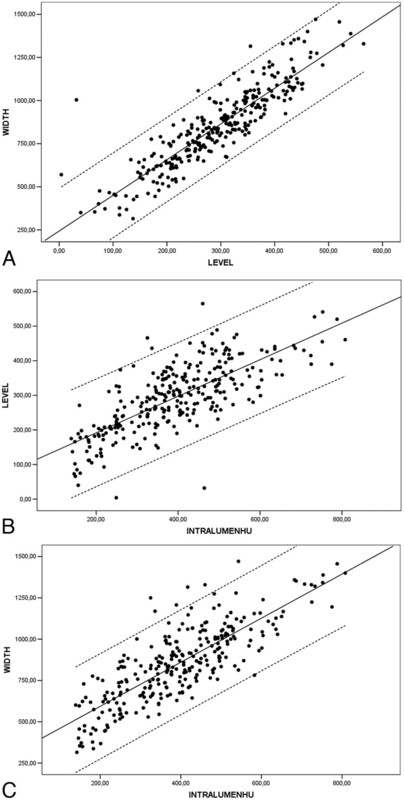 Scatter-plots and regression results showed the correlation between both width and level respectively depending on intraluminal Hounsfield units (HU) value (width = intraluminal HU × 2.07; level = intraluminal HU × 0.72). Obtained data indicated that the presence of different stenosis degrees did not modify visualization parameters. CT angiography (CTA), on the other hand, shows a greater efficacy in the identification of calcified plaques. Yet a relevant bias in calcified plaque assessment is caused by the artifacts derived from its high linear attenuation level, which was indicated in previous studies on coronary plaque visualization.17, 18 This has led many authors during the past years to consider the presence of calcified plaques as a serious limitation of CTA.19, 20 Moreover, the presence of a plaque calcification may increase the risk of an overestimation of the plaque itself due to average volume artifacts.21 The recent advent of multidetector CT (MDCT) with an angiographic approach allows fast acquisitions of carotid vessels with submillimeter voxels, performed with the most highly developed machines, which are near-isotropic.22–24 The dataset obtained may be subsequently postprocessed with different techniques such as maximum intensity projection, multiplanar reconstruction, and volume rendering,25–29 which provide an improved diagnostic efficacy in the evaluation of calcified plaques. The aim of this study was to analyze CT features of calcified plaque and to determine which window parameters show the best agreement in the stenosis degree quantification of this plaque type. Angiographic CT was performed with a 4-detector-row spiral CT scanner (Mx8000; Philips [formerly Picker], Andover, Mass). Patients were placed in the supine position, with the head tilted back to prevent dental artifacts on the images. They were also instructed not to breathe or swallow. Arterial enhancement was provided by the intravenous administration of 100- to 130-mL nonionic iodinated contrast material (in 107 patients, Iomeron 350; Bracco, Milan, Italy; and in 104 patients, iopromide, Ultravist 370; Bayer HealthCare [formerly Schering], Leverkusen, Germany) at an injection speed of 4–6 mL/s by using a power injector and an intravenous catheter inserted into the antecubital vein. We used a delay time variable from 11 to 18 seconds. Angiographic acquisition started at the C7 level and proceeded as far cephalic as possible, including the carotid siphon. CT technical parameters included the following: matrix, 512 × 512; FOV, 11–19 cm; mAs, 180–240; kV, 120–140. Fatty (soft) plaques: a plaque with attenuation values <50 HU. Mixed (intermediate) plaque: a plaque with attenuation values between 50 and 119 HU. Calcified plaque: a plaque with attenuation >120 HU. For the measurement of Hounsfield unit attenuation, a circular or elliptical region-of-interest cursor was used in the predominant area of plaque,32 and those areas showing contamination induced by contrast material were carefully avoided. We used a region-of-interest area from 0.01 to 0.02 cm2. Identification of the plaque type was subsequently performed by 2 observers in consensus. In the retrospective study of images, window values were not previously planned, so each radiologist was free to use those window parameters that were judged most efficient to assess the stenosis degree in each patient. During all measurements, radiologists were asked to score intraluminal Hounsfield unit values. Thus, for each radiologist and for all calcified plaques, analyzed specific window width, window level, Hounsfield unit intraluminal measure, and corresponding stenosis degree were recorded. Finally, all data were correlated. In the calcified plaques, carotid stenosis was measured and graded according to the North American Symptomatic Carotid Endarterectomy Trial (NASCET) criteria33, 34: I, normal; II (1%–29%), mildly stenosed; III (30%–49%) and IV (50%–69%), moderately stenosed; V (70%–99%), severely stenosed; VI, occluded. The grade of stenosis was classified by 2 observers independently. Measurements to quantify stenosis degree were taken by selecting a plane perpendicular to the lumen center line as indicated by Ota et al,35 by using a curved planar reconstruction algorithm. The value was calculated by comparing the stenosed segment diameter with the more distal normal one, in which stenosis was absent. Every time a near-occlusion condition36, 37 was detected, the above-described method was not applied; thus these patients were directly included in NASCET V group. In our final analysis, NASCET I (absence of plaque) and NASCET VI (complete occlusion) were excluded. The Cohen κ statistic was applied to calculate agreement between observers in the categoric degree of stenosis: a weighted κ was used because the categories were ordinal. Window parameters (width and level settings) of axial images were correlated with intraluminal Hounsfield unit values. Multiple scatterplots with their relative regression lines were elaborated a second time. All scatterplots resulted from joining all stenosis classes (NASCET II-V). Window parameters were then singularly recalculated for each class of stenosis to observe if the presence of a certain stenosis degree might determine any variations in window parameters. The Pearson correlation coefficient (r) was calculated to assess the presence and strength of the association between intraluminal Hounsfield unit values, window width, and window level. Finally simple equations were obtained that would standardize studied parameters. Interobserver analysis for the assessed window level and width was provided by using Bland-Altman plots.38 R software (www.r-project.org) was used for statistical analyses. Four hundred twenty-two carotid arteries were studied, and 141 calcified plaques (average attenuation, 947 HU; range, 644.3–1137.7 HU) in 110 patients (82 men, 28 women; average age, 69 years; range age, 37–85 years), 126 fatty plaques (average attenuation, 41.3 HU; range, 24.4–48.9 HU), and 83 mixed plaques (average attenuation, 84.3 HU; range, 56.7–115.1 HU) were detected. In the 141 calcified plaques, observer 1 detected 12 NASCET II plaques, 31 NASCET III plaques, 33 NASCET IV plaques, and 65 NASCET V plaques, whereas observer 2 described 13 NASCET II plaques, 30 NASCET III plaques, 32 NASCET IV plaques, and 66 NASCET V plaques. From the obtained data, we derived an interobserver agreement of 92.2% with a κ value of 0.885 ± 0.033 (95% confidence interval, 0.819–0.950), which indicated significant agreement (Table 1). Given the total amount/sum of measurements (141 from observer 1 plus 141 from observer 2), scatterplots confirmed the correlation between window level and width (Fig 1A) and the relationship between intraluminal value and window level (Fig 1B) and between intraluminal value and window width respectively (Fig 1C). All these parameters showed a significant statistical correlation. A, Scatterplot between width and level (NASCET II-V) with linear regression through the origin, with a 99% mean predictive interval and 99% individual predictive interval. Width = 2.81 × Level. B, Scatterplot between intraluminal Hounsfield unit values (IntraluminHU) and level (NASCET II-V) with linear regression through the origin with a 99% mean predictive interval and a 99% individual predictive interval. Level = 0.72 × Intraluminal HU. C, Scatterplot between intraluminal Hounsfield unit value and width (NASCET II-V) with linear regression through the origin with a 99% mean predictive interval and 99% individual predictive interval. Width = 2.07 × Intraluminal HU Value. The Pearson correlation coefficient was 0.891 (P < .01) between window level and window width values; r was 0.743 (P < .01) between intraluminal Hounsfield unit value and window level; r was 0.808 (P < .01) between intraluminal Hounsfield unit value and window width (Table 2). In particular, the symmetry of scatterplot 1 (Fig 1A) was evident (r = 0.891). Thus, from the regression function of scatterplot 1, we can infer the following equation: Width = 2.81 × Level (first width equation), which postulated that the width should be 2.81 times the level. Scatterplot 2 regression line (Fig 1B) derived the following equation: Level = 0.72 × Intraluminal HU (level equation), which suggested that the level should be 0.72 times the Hounsfield unit intraluminal value. Finally, by the analysis of the regression line of scatterplot 3 (Fig 1C), we derived this equation: Width = 2.07 × Intraluminal HU (second width equation), which demonstrated that the width should be 2.07 times the Hounsfield unit intraluminal value. The relationships between window level and width, intraluminal value and window level, and intraluminal value and window width were respectively analyzed according to stenosis degree, ranging from NASCET II to NASCET V. This further analysis was performed as a double check to evaluate the eventual interference of stenosis degree with visualization parameters. We could observe that there were no significant differences between the various stenosis degrees. All these data, grouped according to stenosis classes, constantly indicated, through the Pearson correlation, a significant statistical value, which showed a strong association among the 3 studied parameters: width-level, intraluminal Hounsfield unit−level, and intraluminal Hounsfield unit−width (Table 2). Intraobserver agreement calculated by using Bland-Altman plots demonstrated a good concordance in the window width analysis but a suboptimal concordance in the window level analysis (Fig 2). Bland-Altman plots of intraobserver variability in the window width (A), window level (B), and intraluminal Hounsfield unit measurements (C). Obs indicates observer. Intralumin-HU indicates intraluminal Hounsfield unit. The purpose of this study was to evaluate the CT window parameters in the study of calcified plaques, defining which of them provides the best interobserver agreement to obtain an optimal reproducibility. The assessment of the calcified plaque is important because even if calcification is not typical for the unstable plaque,39 its accurate depiction allows planning of the arteriotomy site or extent of endarterectomy40 and predicting the hardness of plaque in carotid angioplasty and stent placement.41 Moreover a correct stenosis degree evaluation influences the decision to intervene, by using surgical or endovascular techniques, because it is primarily based on the percentage of luminal narrowing of the vessel. Measurement of stenosis degree in calcified plaques requires some peculiar assessment procedures, taking advantage of all most frequently used imaging techniques such as sonography, MR, digital subtraction angiography (DSA), and CTA. 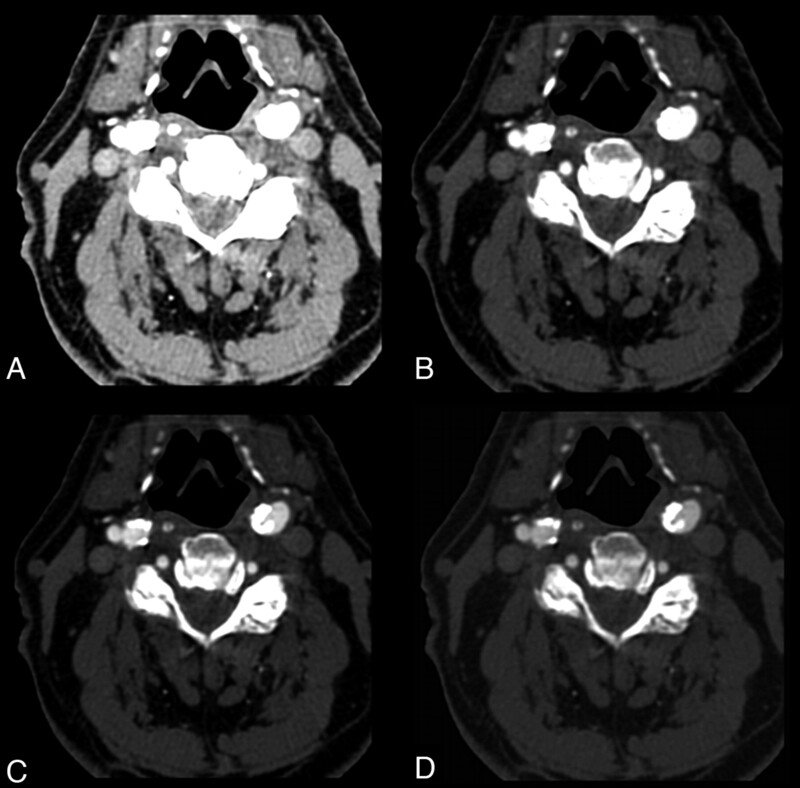 In a sonographic echo-color doppler examination, the presence of a calcified component in the plaque determines the presence of an acoustic shadowing, which may keep radiologists from correctly visualizing the carotid structures.13, 14 For this reason, it frequently happens that patients who previously underwent a sonographic examination need to undergo a second-level examination (CTA-MR imaging) because the operator could not measure stenosis degree due to the presence of acoustic shadowing. MR imaging easily depicts calcified structures, but specific sequences must be used.42–44 Calcification, in fact, was not discernible from the lumen on black-blood images but is distinguishable from the bright lumen on time-of-flight angiograms. Puppini et al45 demonstrated that MR imaging sensitivity in the detection of calcifications is 80%. As reported by Kopps et al46 during the study of calcified plaques of the aorta and of femoral arteries, MR imaging sometimes showed signal intensity loss typical of the presence of calcifications, though after histologic examination, no calcified plaques were found (false-positive presence). Link et al47 demonstrated that the presence of calcified plaques was correctly interpreted with DSA in only 56% of patients. Moreover, DSA was associated with a significant periprocedural morbidity risk of 0.5%–4%. CTA has a high sensitivity in detecting calcified structures; sometimes a bias in the exact evaluation of stenosis degree may be caused by the high linear attenuation coefficient of the calcified plaques.48 Without a correct setup, visualization parameters may significantly alter the resulting image. Moreover, peripheral calcification of the arterial wall causes artifacts that interfere with the evaluation of the stenosis degree. The most efficient window and level settings for the display of carotid stenosis with mural calcifications are still unknown.49 In a previous study,31 we demonstrated that the type (fatty, mixed, or calcified) of plaque affected the interobserver agreement in the carotid artery stenosis degree quantification and that, in particular, carotid arteries with calcified plaque had lower κ values if compared with mixed or fatty ones. The use of wrong width/level parameters can result in a low interobserver agreement. The best value with a fixed width/level for the stenosis quantification of calcified carotid plaque was 0.668. In that work,31 we studied window parameters to identify the best method to achieve high reproducibility (interobserver agreement) in the quantification of calcified carotid artery stenosis degree. In the analysis of carotid vessels, it is important to keep in mind that 2 of the most recurrent artifacts connected with endoluminal contrast injection are the so called “halo” and “edge blur.”50 “Edge blur” refers to the transition or sharpness of the outer luminal margin as a percentage of the luminal diameter. “Halo” artifacts refer to periluminal increased attenuation (partially saturated pixels).50 Actually, the tendency is to use speed flows (≥3 mL/s) to obtain a major intraluminal opacification and, therefore, a better postprocessing visualization. Moreover, a high intraluminal Hounsfield unit value allows a clear evaluation of luminal shape by producing a high-contrast interface between the contrast medium and the vascular wall. For our study, we applied this approach, obtaining an average intraluminal opacification of 392 ± 138 HU (minimum, 139 HU; maximum, 808 HU). In 1997, Claves et al50 reported, in phantoms, intraluminal values that ranged between 150 and 200 HU as optimal values for a correct evaluation of stenosis degree. Nevertheless high Hounsfield unit values lower the edge blur artifacts, whereas halo artifacts do not appear to be connected with intraluminal values. The degree of halo artifacts does not increase with higher attenuation values. A 68-year-old man. CT axial images applying different window parameters. A and B, Intraluminal Hounsfield unit value is 547 (right bulbus). With a 275 width and 30 level (A) and 600/200 (B), it is not possible to differentiate lumen from calcification. C, With 800/300, it is possible to differentiate opacified lumen and calcification. D, By using equations described in this article, we obtained window parameters of 1132/394; a clear differentiation between lumen and parietal calcifications is visible. 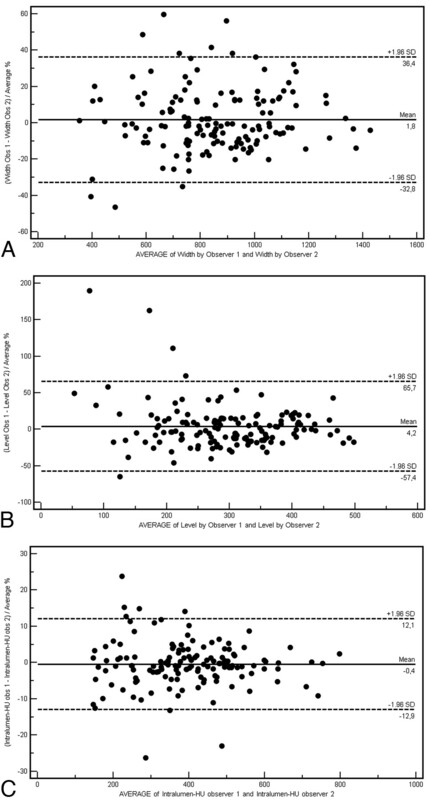 As a further step, we evaluated whether any differences existed in relation to different stenosis degrees, but the obtained results showed that from NASCET II up to NASCET V, no significant statistical difference resulted relative to this point. The 2 observers measured the same window width, window level, and intraluminal Hounsfield unit independently from each other, and interobserver agreement was assessed by using Bland-Altman plots to visualize clearly the differences between the 2 observers. The analysis of Bland-Altman plots demonstrated good concordance (Fig 2) in the window width but a suboptimal concordance in the window level analysis. The concordance in the measurement of Hounsfield unit values was extremely high. Our study has some limitations. First, this is a retrospective study. Second, the resolution of 3D CTA depends on the orientation of the vessel because the pixels are anisotropic. The resolution is approximately 0.2–0.3 mm in the transverse plane but only 0.7 mm in the z-axis; this may limit the measurement of internal carotid artery stenosis (in particular in the NASCET V class). Our study results show that the application of optimized window and level settings at CTA is strictly dependent on Hounsfield unit intraluminal values and that these levels are not necessarily correlated with stenosis degree. Accepted after revision December 13, 2008.